stochosc has been partially removed and will no longer accept a fints object (tsobj) argument. Use a matrix, timetable, or table instead for financial time series. percentKnD = stochosc(Data) calculates the stochastic oscillator. percentKnD = stochosc(___,Name,Value) adds optional name-value pair arguments. Data with high, low, open, close information, specified as a matrix, table, or timetable. 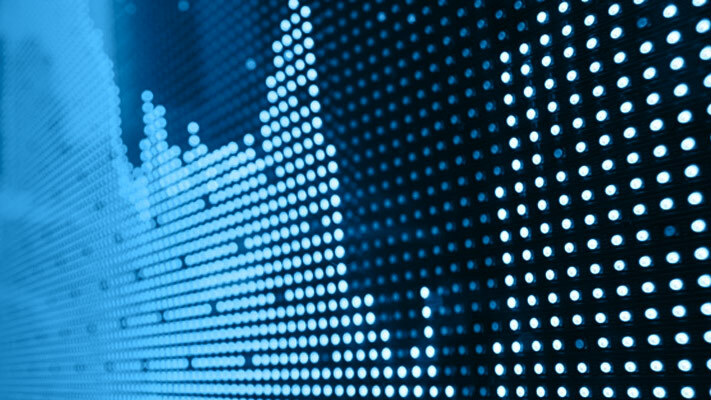 For matrix input, Data is an M-by-3 matrix of high, low, and closing prices stored in the corresponding columns, respectively. Timetables and tables with M rows must contain variables named 'High', 'Low', and 'Close' (case insensitive). Period difference for PercentK, specified as the comma-separated pair consisting of 'NumPeriodsK' and a scalar positive integer. Length of moving average in periods for PercentD, specified as the comma-separated pair consisting of 'NumPeriodsD' and a scalar positive integer. 'exponential' – Exponential moving average is a weighted moving average. Exponential moving averages reduce the lag by applying more weight to recent prices. For example, a 10 period exponential moving average weights the most recent price by 18.18%. 'triangular' – Triangular moving average is a double-smoothing of the data. The first simple moving average is calculated and then a second simple moving average is calculated on the first moving average with the same window size. PercentK and PercentD, returned with the same number of rows (M) and type (matrix, table, or timetable) as the input Data. 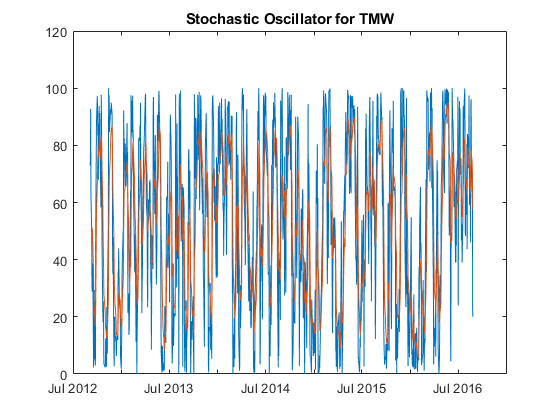 The stochastic oscillator calculates the Fast PercentK (F%K), Fast PercentD (F%D), Slow PercentK (S%K), and Slow PercentD (S%D) from the series of high, low, and closing stock prices. By default, the stochastic oscillator is based on 10-period difference for PercentK and a 3-period exponential moving average for PercentD. Achelis, S. B. Technical Analysis from A to Z. Second Edition. McGraw-Hill, 1995, pp. 268–271.